Predpokladam, ze Vampire/Apollo se nakonec vydaji cestou pololegalniho driveru bez podpory (a proti vuli) vlastniku Picasso96. Proc pololegalniho? Minimalne v Evrope to je pravdepodobne z pohledu vyrobcu Vampire naprosto legalni. Ale i tak je moznosti vice. Zjistuji se podminky, za jakych by slo misto P96 pouzit CGX a jako dalsi moznost se rysuje pouziti RTG z AROSU (klon CGX). Stejne tak se predvedl Hyperion, pro nez je zvyseny zajem o 68K neprijemny a v podstate prima konkurence. Proto jsem napsal pololegalni - nazory na tuto vec se ruzni - ja osobne v tom legalni problem nevidim. Co se tyce Hyperionu, zverejnene podminky jsou pochopitelne (zaplatte, udelejte si driver, ale od nas nic necekejte...). Edit: Gunnar na A1k.org uvedl, ze Hyperion se Apollo teamu dotazal, zda by radeji nechteli delat hardware s PowerPC. To jako zakazeme i winuae? P96 support pro WinUAE ma na triku Brian King. Ten to vytvoril pravdepodobne na zaklade licence (tento driver nikdo nezpochybnuje), ale nikde v zadnem souboru neni uvedene, ze by to King releasnul pod nejakou rozumnou licenci, na ktere by se dala postavit legalnost ovladacu vzniklych na zaklade techto souboru. Vsede je jen uvedeno Copyright 1997 Brian King. Někde jsem to četl, prostě Deneba dělali dva, jeden HW druhej SW. Pak se dotoho hacknul Elbox a začaly problémy, které vyústili v konec E3B a tedy konec výrobz Subwayů a Denebů. Po nějaké době, když se lidi ptali HWráře, tak řekl, že on by problém neměl, ale nebude obcházet SWráře, který další produkci prostě neschválí. Pak přišel Jens a s oběma se nějak dohodnul, SW převzal a podle mého i nějaký ten know how od HWráře. Tohle asi nebude pravda. Narazil jsem na diskuzi z roku 2011, kde se k tomu vyjadril jak Michael Böhmer tak Chris Hodges a podle vseho se nepohodli mezi sebou a uz to nejde nijak "spravit" ani skrze nezavisleho prostrednika. Já mu nevěřím ani slovo od Indivision AGA mk2. Ten email s vyhruzkama ze je znici jak zverejnil Majsta, to psal taky Jens? Majsta zverejnil nekde primo zneni toho emailu? Nevím, Jens se zatím přiznal k autorství toho emailu, kde chce licenční poplatky za P96. Ja jsem myslel to co jsi psal v prispevku #40. First, thank you for your trust, support and patience. You are helping to make this project a reality! In the last weeks, I have been working hard with Scarab Hardware to turn the prototype into a finished product. Around a week ago I received the first sample of the first release candidate. I managed to get it working in my A2000 and A3000 and sent it off to an EMC (electromagnetic compatibility) lab for CE compliance testing. This is required for me to be able to legally sell this product. I also made a contract with a company that takes care about recycling (WEEE), another legal requirement for shipping the card. As expected, the sample only partially passed EMV testing in the first round. It sends out some peaks in the RF spectrum that are a bit too high. In parallel I discovered that 3 signals on the board have to be rerouted to make the Zorro III mode possible. 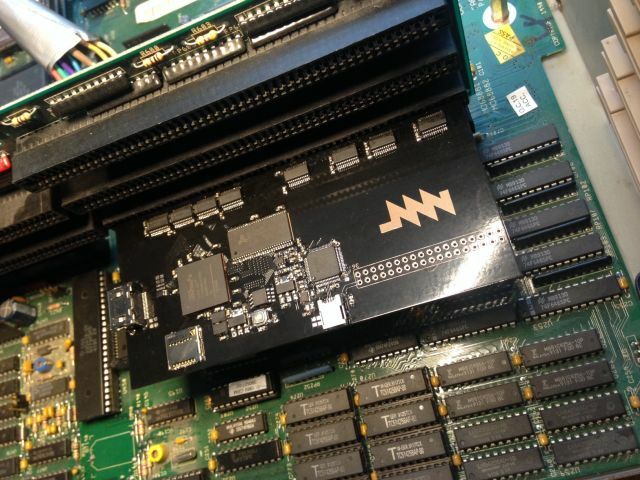 Scarab are working on the second sample that will include EMV filtering, ESD protection and fixes to the routing. I expect that we will be able to pass the testing with this second sample which I should receive between the 8th and 12th of August. 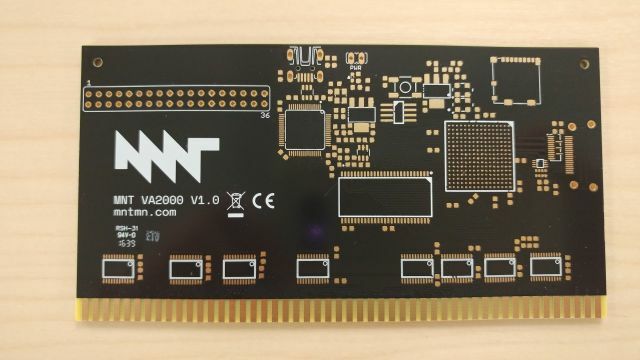 If all goes well, we can start production of the first 100 boards. As the main chips have already been ordered, we expect this to go quickly and you should receive your boards in the middle of September. Nooo a jak to skoulel s tim ovladacem? Je to za dveřma, tento tejden karta prošla EMC testem a začíná se vyrábět. Navic karta je nyni fully ZIII compatible/capable. 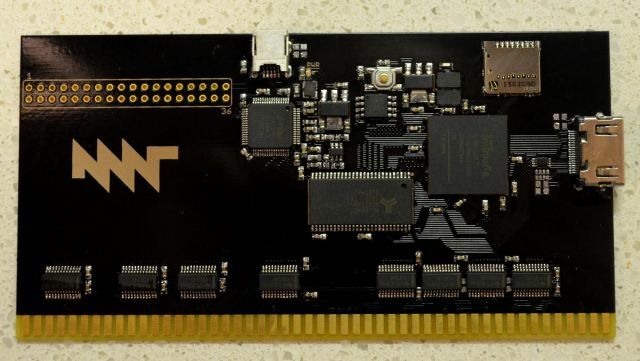 The production of the cards was delayed for another 2-3 weeks, but I am happy to tell you that the PCBs are done and currently being assembled in the USA (sample picture of final PCB attached). I expect the batch to be shipped to me next week (I'm in Germany). After customs processing, I will manually flash each of them with the FPGA code and do a quality check. I have also been waiting for over 6 weeks to be assigned a WEEE number by Stiftung EAR, the pseudo-government body that regulates who is allowed to distribute electronics from Germany. I heard that they can take up to 8-10 weeks to assign a number. I go to their website every day to check if maybe I'm finally in the database. I keep my fingers crossed that they will assign the number before I'm ready to ship. If they don't, my current worst case estimation is that I can ship to you on November 14th. The best case would be in 1-2 weeks. Sorry for the additional delay and thanks again for your ongoing patience and support! Oh, before I forget it: With great support from Radoslaw Kujawa, I wrote a framebuffer driver for NetBSD/m68k so you can use MNT VA2000 with NetBSD on your Amiga. It is already in the official NetBSD source tree. Tak karty vcera doputovaly z USA do reichu. Časové pásmo nastaveno na GMT +2. Aktuální čas: 18:41:12.